We’d love your help. 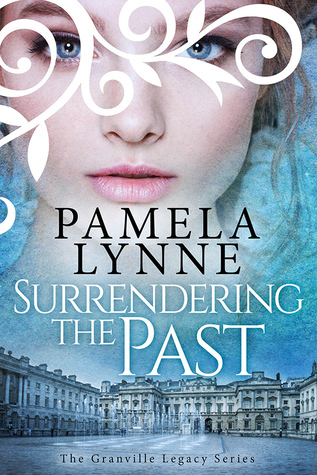 Let us know what’s wrong with this preview of Surrendering the Past by Pamela Lynne. To ask other readers questions about Surrendering the Past, please sign up. A dark family legacy, a prodigal son returns, a young woman caught in a web of deceit, and an evil that will take great cunning to defeat. This introduction to the Granville Legacy set things in motion and I can't wait to see it all play out. I loved this story's classical gothic romance atmosphere and the introduction to a fantastic cast of characters even the evil Earl of Litchfield who I loved to hate on. It's like a historical romantic suspense with a large cast of characters full of strength A dark family legacy, a prodigal son returns, a young woman caught in a web of deceit, and an evil that will take great cunning to defeat. This introduction to the Granville Legacy set things in motion and I can't wait to see it all play out. I loved this story's classical gothic romance atmosphere and the introduction to a fantastic cast of characters even the evil Earl of Litchfield who I loved to hate on. It's like a historical romantic suspense with a large cast of characters full of strengths, flaws, tangled feelings and relationships and plottings. I got a taste of the complex and twisting plot that this was merely the opening gambit for what is to follow. This was a shorter piece and set the table well for the series. It read fast, but was developed and had time for a sweet romance to build between Richard Granville the second of Litchfield's sons and the lovely, sweet Jane who misguidedly is willing to sacrifice much for familial duty and affection. A few other promising situations are introduced even as the book wraps up with a mystery and a new threat. Having read and adored all of Pamela Lynne’s previously published novels (see here for proof), I was elated to learn that she was working on a traditional Regency Romance series. A series that would tell the emotional and turbulent tales of three men from the Granville family and the women who love them. As a reader who loves traditional Regency Romances and on who has great affection for Pamela Lynne’s original character, Viscount Hedley, I was very excited and eager to read a series that includes a whole cast of original characters. Surrendering the Past, the first book of The Granville Legacy Series, introduces all three Granville men and gives a bit of history on each of their lives, but focuses mostly on Captain Richard Granville. Captain Granville is the second son of the Earl of Litchfield, and their relationship is strained and filled with resentment and mistrust. While he is on leave from the army, the Earl of Litchfield summons Captain Granville to his side in order to announce his upcoming nuptials to an unknown beauty without a fortune. Who is this angel and what duty compels her to marry the evil Earl of Litchfield? What a splendidly gripping introduction to the Granville family! I loved all the characters introduced (especially the men! ), and I greatly enjoyed the complex personalities and challenges Ms. Lynne bestowed on each one of her characters. Not only with our brave hero and worthy heroine, but with the supporting cast as well (which I believe will be featured more in the next installments of this series). Alongside Captain Granville and Jane Dawson, readers will encounter Julian Hale (Captain Granville’s brooding cousin that has eschewed society these past couple of years), Wesley Granville (Captain Granville’s older brother who dutifully follows his father’s every wish but may have some secrets of his own), Amy Dawson (Jane’s younger sister who isn’t afraid to speak her mind), and Lady Rachel Blanchard (neighbor and friend to the Granville brothers who tragically lost her betrothed a few years back). And to top it all off, Pamela Lynne creates a most vile, dangerous, and heartless antagonist with her creation of the Earl of Litchfield. Such a baddy! Not only are there well-drawn characters in this tale, but a lot of riveting action too! As the events build up to the story’s climax and resolution the pacing escalates as well. It is such a gripping tale and with all the surprising twists that take place along the way, I wouldn’t have minded if this story was fifty pages longer to give these events more time to progress and develop. At 147 pages, felt more like a novella than a novel. Mistrust and mistakes, danger and deceit, sacrifice and secrets – the Granville family is filled with enthralling drama and adventure! Even though this installment ends with a satisfying resolution, there are hints that there is more angst and drama in store for the Granville men! I, for one, cannot wait to spend some more time these engaging and worthy characters! Highly anticipating the publication of Book 2: Redeeming the Past! There is a delicious cast of characters in this story and each are well developed. You are completely drawn in as Richard slowly but surely maneuvers his way around his father and his minions. All the while, keeping Jane Dawson, his father's betrothed, in his sights. For no woman is safe married to the Earl of Litchfield. "It was the voice Litchfield always gave when he was up to something vile - the performance before the mask was removed to reveal the evil underneath." I was completely captivated and riveted to this dark but romantic tale. The Granville men have secrets and danger stalks them, unless they can unravel the mystery of their legacy. I highly recommend this well written Regency romance with a gothic twist. I am so looking forward to Book 2 in the series! Cliffhanger alert: for those who need to know, according to another reviewer, this book ends with a cliffhanger. It was published 4 or 5 months ago, and there is no second book yet. The story opens pretty good, but there seems to be about three different relationships trying to blossom. I just wanted to focus on the main one, but that's not really possible. I just loved this short historical read that gave me a fascinating family of males, Granville. There were moments of intrigue, suspense, wrapped in a family legacy of darkness, shame, torture, and desperation. This was a great kick off to a new family from Pamela Lynne. I love the era and the story. The characters were introduced too many too fast. Would have loved and extended version of Richard and Wesley's past. Wow, packed with everything wonderful. Surrendering the Past will leave you wanting more especially since there is a cliffhanger ending. The book will be familiar to P & P JAFF fans who I think, like me, will have a hard time not substituting P & P character names for the ones used in the book. The men are swoon-worthy and Lord Litchfield is a great villian. The book reads well and quick. You won't want to put it down. My only complaints are that the print version needs to correct what I Wow, packed with everything wonderful. Surrendering the Past will leave you wanting more especially since there is a cliffhanger ending. The book will be familiar to P & P JAFF fans who I think, like me, will have a hard time not substituting P & P character names for the ones used in the book. The men are swoon-worthy and Lord Litchfield is a great villian. The book reads well and quick. You won't want to put it down. My only complaints are that the print version needs to correct what I are assume are computer-edit mistakes and that it ended without the second book being available. Loved this one!